So you’ve been recently promoted into a leadership position – congratulations! – but what do you do now that there are people you actually have to manage? The problem is – being a leader is easy; becoming a great leader isn’t. And it’s infinitely worse when you’re totally new to leadership. 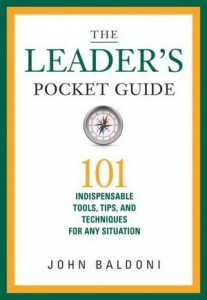 That’s where “The Leader’s Pocket Guide: 101 Indispensable Tools, Tips, and Techniques for Any Situation” can come in handy. The book is authored by leadership guru John Baldoni of full-service coaching and leadership development firm Baldoni Consulting, who has written other leadership books such as “Lead by Example: 50 Ways Great Leaders Inspire Results” and “Lead Your Boss: The Subtle Art of Managing Up“. It’s easy to discount the little tome – which comes in at just over 200 pages yet small enough to slip into a coat pocket – but the leadership principles it covers pack a massive punch. The 101 leadership nuggets enclosed covers various situations you may find yourself in as a leader, representing some of the best insights into leadership thinking that can be easily absorbed and put into practice. These points are split into three different sections, “Self”, “Colleagues” and “Organization”, basically highlighting the three different areas that a leader needs to work on if they want to be effective. For example, let’s take a look at Point No. 8, ‘Making The Choice Not To Manage’, under the section “Self”. Most people are actually quite happy where they are, and here Baldoni argues that there is nothing wrong in turning down a promotion to focus on their passion rather take up a management position. Or how about Point No. 36, ‘Help Your Team Avoid Burnout’, which recommends that the best way to avoid a team fizzling out is for a leadership to focus on their team’s success as opposed to their own success. There’s little mumbo-jumbo (or worse, meaningless leadership theories and hypothesis) in “The Leader’s Pocket Guide“. All of it is practical advice, plenty food for thought for the newly appointed leader, and even for a seasoned boss. Just as well the “The Leader’s Pocket Guide” is small enough for one to discreetly pull out and refer to when faced with a certain leadership issue. Chances are there’s a good solution in there somewhere.